When you have been involved in any area of endeavor for over 30 years, you form strong opinions about the way things are. As well as about the way things should be. For instance, I took my first professional firearms training course at age 19. Although I had no real point of reference at the time, I was fortunate to be taught by one of the most talented fighting pistol instructors that the United States had to offer. In 1986 I participated in a 4 Day/40 Hour handgun training course taught by John S. Farnam. Farnam, a Marine Corps officer and platoon leader in Vietnam, has been at the forefront of firearms training in the United States for some 40 years now. Being only 19 years old at the time, I could not purchase my own pistol. Instead, I had to rent one from the school for the duration of the course. The handgun was a WWII surplus M1911A1 in .45 ACP. The in stock configuration included the tiny (by today’s standards) fixed iron sights. For the next 30 plus years, I would engage in firearms training within the United States Marine Corps, the Law Enforcement Academy training, as well as some of the best private firearms training schools and academies the United States has to offer. “Front sight, front sight, front sight, trigger press” was the mantra drilled into my head from the very beginning. In order to hit the target, a student must see and focus on the front sight. They must also apply steady, deliberate pressure to the trigger (without disturbing the sight focus). That simple sentence is the key to firearms marksmanship. Despite how simple it might seem, mastery of that technique requires dedicated, deliberate training and practice. Seeing the front sight is not all that difficult if the light is good and the shooter’s vision is sharp and clear. In reality, when a handgun is needed for self-preservation, the light is just as likely to be poor as it is good. Also, as a shooter ages, the ability to focus clearly on a small, black front sight becomes increasingly more difficult. 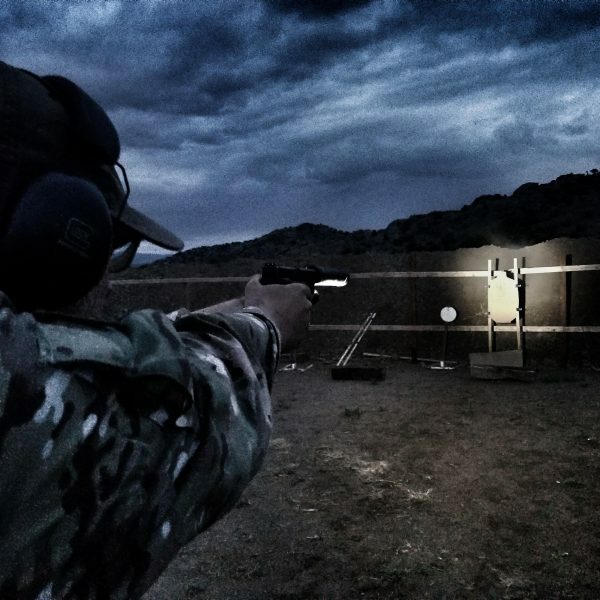 Front sight focus and skillful trigger press do not become less important when it is dark and the shooter has a hard time seeing clearly. As such, tremendous technological strides have been made in sight design since the M1911A1 was the issued sidearm for the US Army. When my friend Jacob Herman of Night Fision approached me and asked my opinions regarding what kind of pistol sights should be on a pistol used for fighting/self-preservation, I naturally had some strong thoughts. 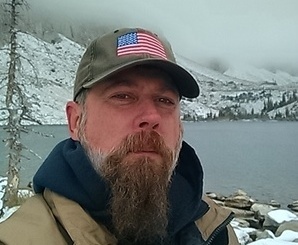 For three decades plus I have trained with handguns using fixed (black) iron sights, painted 3-Dot sights, gold bead front sights, all manner and color of front sight ramps, 3-Dot Tritium sights, and unconventionally shaped sights. “If you could design a set of sights from scratch, what would you make,” asked Jacob. As simple as that question sounds, the answer was not simple at all. Mainly because said pistol sights would not just be for me, but for everyone else in the shooting world. How do you come up with a design for shooters of all skill levels? From law enforcement to military, to the armed citizen. The pistol sights will be for shooters that not only need to meet departmental and agency qualification courses. They will also be there to save their lives and the lives of others in the gravest extreme. I was not going to take this task lightly. My task was not simply to reinvent the wheel, but to create a design that was truly universal. One of the biggest stumbling blocks for me was to address perception versus reality. Having been a law enforcement officer for two decades, I understood the perception that the average police officer has regarding pistol sights of unconventional shapes and designs. 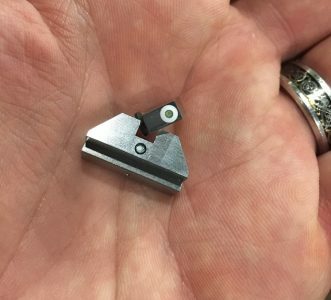 In the minds of most, they need standard square post/square notch rear sights so they can get passing scores or even expert scores on their marksmanship qualification tests. The perception remains that unconventional or “express” sights are okay for close up, but not good enough for precision marksmanship. While I know that to be a false assumption, I am again fighting a deeply entrenched perception. Also, 3-Dot sights, whether painted or Tritium, while perceived by the shooting public as the “best option” are genuinely the exact opposite. These sights are actually the worst set up for a fighting/self-defense handgun. These 3-Dot sights either put twice as much light reflecting or light producing (in the case of Tritium) material closer to the shooter’s eye than the all-important front sight. Of the two sights, seeing the front sight clearly and quickly is a hundred times more critical than seeing a bright, clear rear sight. However, again we have a perception problem. The average handgun buyer does not have the education and experience to come to the aforementioned conclusion on their own. Instead, someone sells them on the “line up the 3 dots” over-simplified pitch or a self-imposed perception. Also, there is the complaint that some sights on certain police duty pistols did not offer point of aim/point of impact results with the ammunition supplied to law enforcement officers. This was another area that needed addressing. In addition to all of the previous issues, some factory installed sights are sloped, slanted, or made of plastic or other less-than-robust material. Again, real issues to be addressed. offer point of aim/point of impact with a standard fighting pistol load. That was no small undertaking. With all of the different makes and models of duty pistols as well as caliber choices, the first task was to come up with a base model handgun and ammunition choice. Trying to please all people, all the time, would kill the project before it began. The pistol choice, though very deliberate, was not all that difficult. 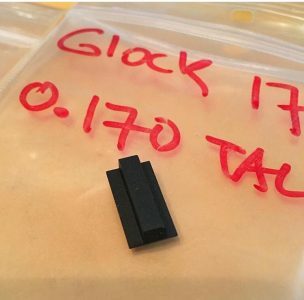 I chose the GLOCK 17 in 9x19mm. 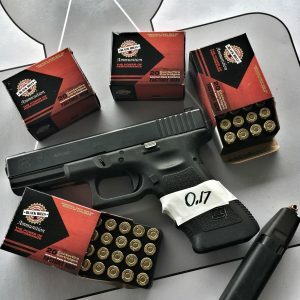 The G17 is the most prevalent Law Enforcement issue handgun in the United States. It is also very likely the top personal defense pistol in the hand of citizens. As for ammunition, specifically the projectile weight, design, and manufacturer, this choice again required deliberation. 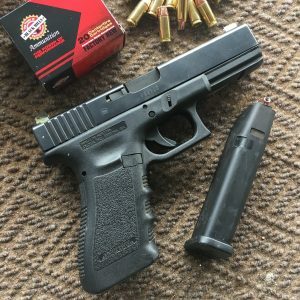 The base ammunition for the development of the new pistol sights would be the Black Hills Ammunition 124 grain Jacketed Hollow Point factory new load. They load the cartridge to 1150 feet per second. While there are innumerable factory 9x19mm loads available, I decided on the Black Hills load. I know that there is no honest person in the shooting industry that will argue about their quality control. I have visited the Black Hills plant and can say without reservation that they have the highest quality control standards of any ammo maker in business. Literally, someone inspects every component that goes into a cartridge of ammunition before assembly. There is inspection throughout the process and every cartridge is viewed by the eyes of a human before it is sent out the door. With the make and model of the pistol and ammunition chosen, the next step was to determine what height the front sight would need to be. The pistol sights would be fixed, not incrementally adjustable target sights. Windage can be adjusted by tapping the rear sight left or right slightly. The elevation, however, would be determined by the sight height. The goal of this sight project is for the projectiles to impact point of aim/point of impact at 50 feet. When I was a police officer, 50 feet, or approximately 17 yards, was the furthest distance required during handgun qualification. Conducting research for law enforcement agencies nationwide, I was able to confirm that, by and large, 50 feet was the average furthest distance for police pistol qualification. By comparison, the United States Navy pistol qualification requires troops to fire rounds from 5, 10, and 15 yards. Night Fision shipped me two different height front sights; 0.170 inches and 0.180 inches. Using the BH load, I fired the Glock pistol using a rested position at distances from 3 yards to 50 feet. After about 50 or so rounds, I was able to determine that the 0.170-inch front sight would be the best choice. For this test, I paired a standard Night Fision rear sight with the test height front sights. The next step would be to test a prototype set. Night Fision fabricated two complete sets of the new SOTG sights. This time with a Tritium front sight insert in the front and a smaller single Tritium insert in the rear. The rear sight would have hard 90 degree angles back and front deliberately, no slope. They also tapered the outer edges. For testing, an advanced opaque polymer surrounded the front sight Tritium; one in white and one in fluorescent yellow. In order to speed the testing process, Night Fision sent the original prototype pistol sights “in the white”, uncoated. The material was still silver stainless. I mounted the white dot version to Glock 17 and the yellow dot set to a Glock 19. Again, I would head to the range for slow fire, bench rested testing. I was very pleased to find that the point of aim/point of impact at 50 feet with the BH 124-grain test load was right where it should be, aside from needing to make a slight rear sight adjustment. While at the range I engaged a steel, half-silhouette target that was approximately 45 yards away. Hits on target were constant and reliable. Prototype SOTG sights “in the white”. I equipped the Glock 19 pistol with a threaded barrel. When I attached my Advanced Armament TiRant 9mm pistol silencer to the gun, I discovered that the top of the front sight was even with the top of the silencer body. Constant, reliables hit on the aforementioned steel silhouette target while standing, 25 yards away, were no problem at all. Many folks gravitate toward “suppressor height” sights for use with gun mufflers. What we had inadvertently done was build fighting pistol sights that would work with or without a silencer in place. With the accuracy testing completed, it was time to greenlight the finished product. The Official Student of the Gun sights from Night Fision would be released with the choice of either a white dot/Tritium front sight or a fluorescent yellow dot/Tritium front sight. I gravitate toward white front sights, but for reasons explained ad nauseam for 20 years, we made the decision to let the buyer decide. So there you have it, Official SOTG fighting pistol sights from Night Fision. The combination of Tritium and front sight color allows the shooter to use them in all light conditions. Not just on sunny days at the range. The construction is solid steel so they will be robust enough for genuine field or duty use. The rear sight Tritium is dim enough not to overpower the front but is still visible in low light.